The physiochemical property that allows compounds to be separated through partitioning is called the Partition coefficient (K). This is defined as the concentration (C) of a compound in the upper phase of a specific specific two-phase solvent system divided by the concentration of the compound in the lower phase of the same two-phase solvent system (C[upper]/C[lower]). Advancements in strumentation are driven by improving partitioning efficiency! For historic reasons and due to the lack of harmonization, the "CCC" nomenclature is rather fragmented in the literature. Due to the historic hyphenated spelling of "counter-current", the non-hyphenated spelling of "countercurrent" used today continues to be still abbreviated as "CC" rather than "C". Accordingly, CCC typically stands for "counter[-]current chromatography". 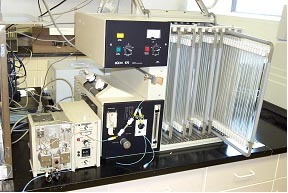 One major stream of "CCC" instrument development led to a wide range of centrifugal partition chromatographs ("CPC"; hydrostatic instruments) and has emphasizse partitioning as its underlying mechanism. At the same time, the name of another line of instruments, generally termed high-speed countercurrent chromatographs ("HSCCC"; hydrodynamic instruments) or variants thereof, has continued to use the original "CCC" term. Notably, both CPC and HSCCC instruments share the same basic principles of operation and chromatographic theory, as well as user base. Reflecting the shared principles, we have been using the unifying terms "countercurrent separation" ("CS", syn. "CCS") to describe both principal methods. In the 1940s Lyman C. Craig invented the first apparatus (besides a separation funnel!) to conduct counter-current partitioning; he called this Counter-current Distribution (CCD). Shown here is an apparatus built by Hecker (Tuebingen, Germany) that allowed manual CCD of samples. 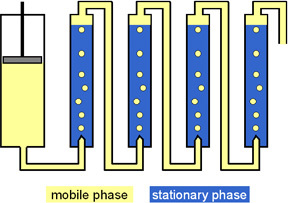 The concept: One phase drips through the second phase, in ascending (upper phase = mobile) or descending mode (lower phase = mobile). Co-developed by Alain Berthod (Univ Lyon, Villeurbanne, France) et al. Armbruster, J. et al. Journal of Liquid Chromatography and Related Technology 24, 1827-1840 (2001). Alvi, K. A. Journal of Liquid Chromatography & Related Technologies 24, 1765-1773 (2001).